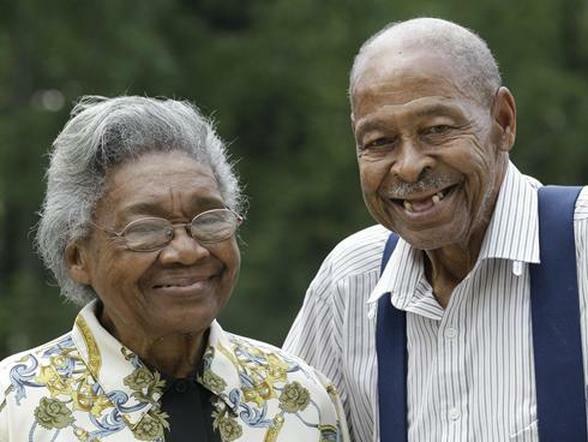 ​Lena Henderson and Roland Davis got married as teenagers in Chattanooga, Tenn., during World War II. On Saturday, the 85-year-olds are getting re-hitched in Buffalo, nearly 50 years after they divorced, according to Cupid’s news cherubs. “I think we just kept thinking about each other all the time, even though we were so far apart,” said Henderson, a widow after her second marriage. After divorcing in 1964 — nobody is saying why — they kept in touch, even as Davis moved around the world. His new wife even used to call Henderson for advice. They last saw each other in 1996 at a family funeral. “Every person I share this story with smiles, cries or laughs,” Chadwick said. Davis proposed over the phone at Easter. He arrived in suburban West Seneca from Colorado Springs with an engagement ring “pinned to my T-shirt” so he wouldn’t lose it. With four generations of family watching, including the four children they had while married, the forever lovers will re-tie the knot at a church, which they didn’t do as teens. A reception will follow, but, once again, no honeymoon trip. “I’m just happy that we’re here,” said Davis.